I love making vegan ravioli! This filling is a creation I made up for my son when he started eating real food. I roast carrots and zucchini and blend it with white navy beans to make a roasted vegetable pate that is full of nutrients. A while back, I had all of the ingredients so I made a batch which I froze and then used it in these delicious, decadent raviolis! Slice the carrots and zucchini into sticks about the same size. Coat with olive oil, salt and pepper and place on a baking tray in the oven. Roast for about 20 to 25 minutes. Watch them; you don’t want them to get too well done for this purpose. Put the navy beans and the roasted vegetables in a bowl. Add in a few teaspoons of bean water and some olive oil. Using an immersion blender, mix it together. You may need to add more oil to get a nice thick consistency. Dice the shallot as finely as you can. In a small skillet, on medium heat, melt the Earth Balance into the olive oil. Drop the shallots in and cook until crispy. Takes a minute or two. 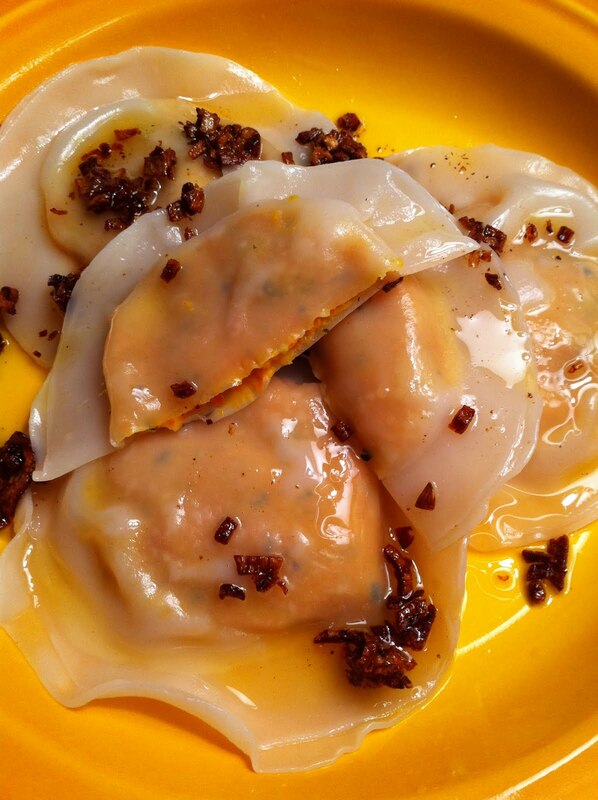 Take 2 won ton skins at a time. Place one down on the plate and fill with a heaping tablespoon of pate. Using your finger, trace the edge with the cold water. Place the other wrapper on top. Place on the baking sheet and cover with damp towel. Do this until they are all done. Using a strainer, drop the ravioli into the boiling water. Take them out when they float to the top. It doesnt even take a minute! To serve, drizzle a shallow bowl with the shallots and place the raviolis on top. Top with more shallots. Drizzle with the extra olive oil/Earth Balance mixture. Enjoy!